Not so long ago I was in need for some color bomb or color blocking dose. It was a gloomy day and, on days like these I like to wear some really bright colors ( it really works for your morale). I was looking in my wardrobe for one of the brightest coats that I own and I decided that I will go bright with the whole outfit. In 10 minutes I was done and it was really fun (coloristic speaking). A finish touch with textured espadrilles and a bag was the cherry on top of this look! P.S. Congrats Dosta Radnjanska ! You are the winner of Shoptiques.com $50 gift card! I’m a HUGE fan of color-blocking! I adore this look, since the colors aren’t shy and yet they look easy to the eye. Gorgeous look dear. love bright colors in the winter! Wow! You have an amazing sense of colour! so nice! love that mix of colors! Love this color block look! Perfect! You pair the most unique colors! I love your blog! Thank you dear so so much. I’ve just responded your email. I love this, the colors are so inspiring. We need color in the winter because it’s so dark. 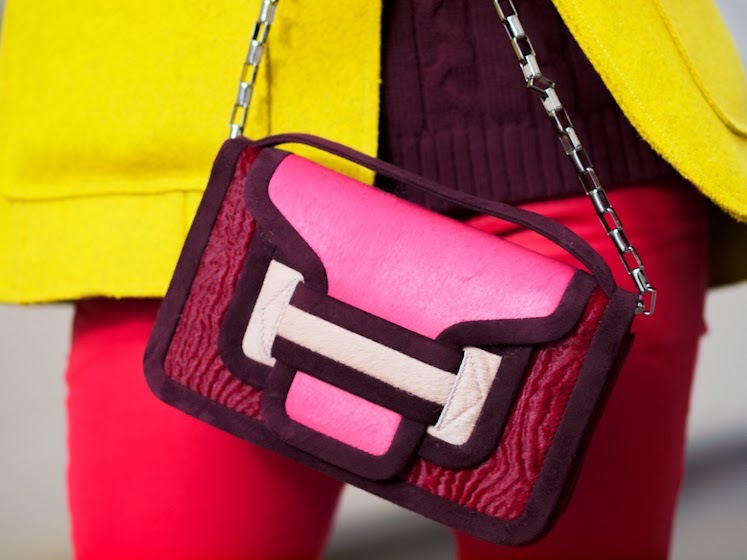 Great purse that adds drama to our outfit! Great color combo!!! You look amazing! Great colours! They made my day!